Vanesa Campos can't wait for winter vacation. Skiing on the slopes, sipping hot cocoa . . . her week at Pinecloud Lodge promises to be cozy and perfect. And maybe she can make some new friends! 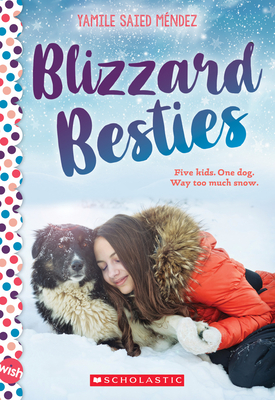 Never mind that glamorous Beck writes off Vanesa right away; twins Emma and Eric are ready to join the fun out in the snow. But when the flakes start falling, everything changes. Vanesa's little brother, Hunter, might be stranded out in the blizzard! Vanesa will have to team up with all the kids -- plus one giant dog -- to rescue him. Can she save her brother and discover which real friends will weather the storm with her? Yamile (sha-MEE-lay) Saied Méndez was born and raised in Rosario, Argentina, but has lived most of her life in a lovely valley surrounded by mountains with her husband, five kids, and two dogs. She loves meteor showers, deer, and spooky stories on stormy nights. Although she’s a self-proclaimed summer creature, she thinks snow is pretty magical. A Walter Dean Myers Grant recipient, she’s also a VONA Workshop (Voices of our Nations) alumna and a graduate of the Vermont College of Fine Arts. Connect with her at yamilesmendez.com.